In Jerusalem, I stayed in a boutique hotel between the Ben Yehuda pedestrian street and the restaurants on Yosef Rivlin—a “happening place”. The first 12 photos are the hotel and nearby streets. It's a short 1 km walk SE to the Jaffa Gate to the Old City, and slides 13-54 were taken on that walk. The last nine photos are primarily the interior of the Conegliano Veneto Synagogue, 1701, which was brought to Jerusalem in 1951, but not reassembled until 1989. 56-On entering the Conegliano Veneto Synagogue, you look east, over the Bimah to the Ark. The original synagogue was in use until 1918. 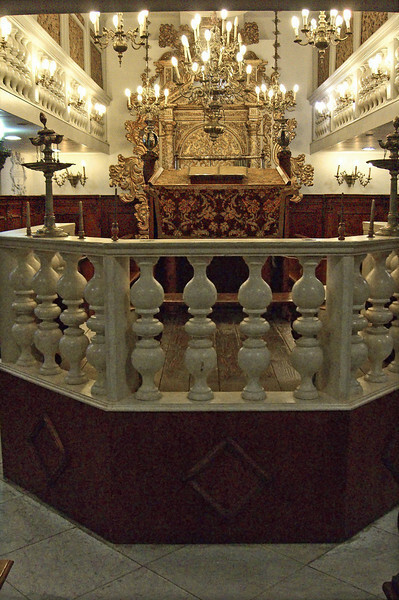 In 1951, Italian Jews transferred the synagogue interior to the Schmidt Compound, where the Italian Jewish community already gathered to pray.